Right off Interstate 40, this Hampton Inn offers an outdoor pool and a gym, 7 minutes’ drive to downtown Kodak. Knoxville and the University of Tennessee are 20 miles away. Free Wi-Fi and cable channels are featured in each room at Hampton Inn & Suites Sevierville at Stadium Drive. A well-lit work desk and a handy computer lap desk are also available in all rooms. A hot breakfast is served daily at Sevierville at Stadium Drive, and breakfast bags can be arranged. The hotel’s staff can suggest the best places to try a gourmet steak or a southern-style barbecue. 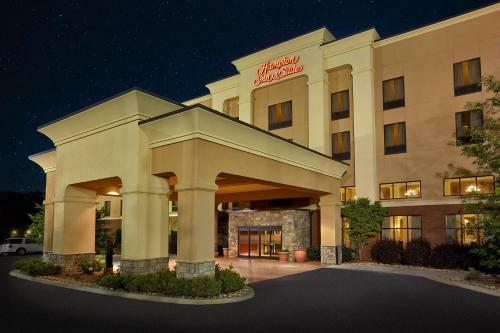 McGhee Tyson Airport is about 30 miles of Sevierville at Stadium Drive Hampton Inn & Suites. Sevierville Convention Center is a 25-minute drive away. the hotel Hampton Inn & Suites Sevierville at Stadium Drive so we can give you detailed rates for the rooms in the desired period.